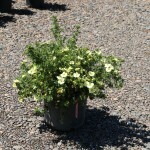 A compact, upright shrub with single yellow flowers that are slightly darker in the center. 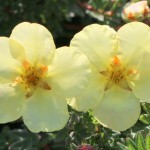 The large flowers appear late spring through fall. The foliage is a dense gray-green. It adapts well to poor, dry soils. Prune as need to maintain the desired form. PP 20,302.